Today we have good news for all users of the LibreLink app for smartphones. Since the scanned values of the Libre sensor can also be transferred to the web app "LibreView" and the data can also be exported as a CSV file, we have now also created a separate import filter for this file. Therefore, reading out the Libre reader with the Libre software is no longer the only option to import this data into SiDiary. we are sorry, but the company Abbott has terminated the license agreement, which allowed us to read the data from the Libre device directly with an USB cable by using their specifications. Especially for users with a CGMS or Freestyle Libre the current version 6.1.1312 might be interesting. 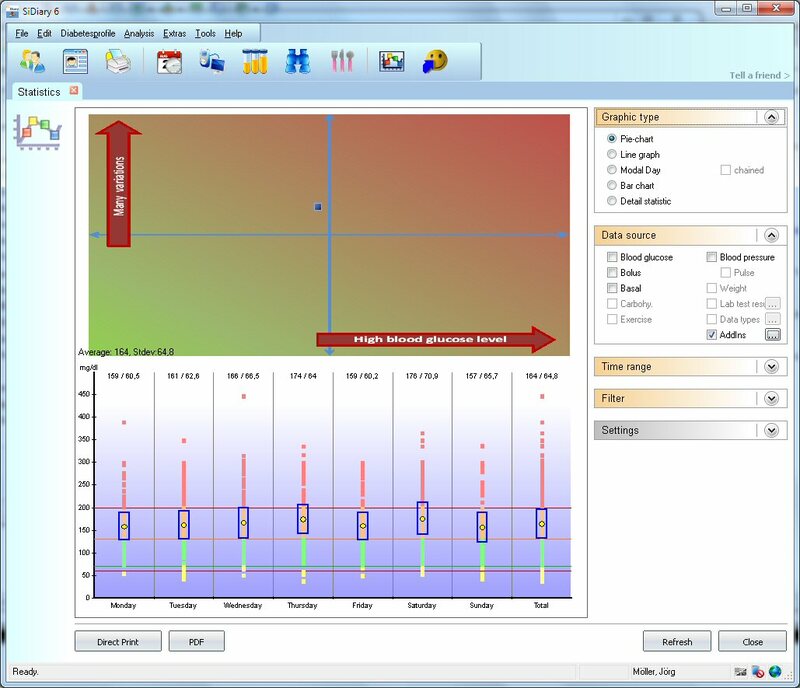 It provides new graphics type 'Glucose Profile' in the statistics section, which shows the median of the CGMS values as well as the standard deviation. With this new option it is not only possible to see the magnitude of the CGMS values over the time of the day, but also how strong these values are waving or how stable the glucose development is. 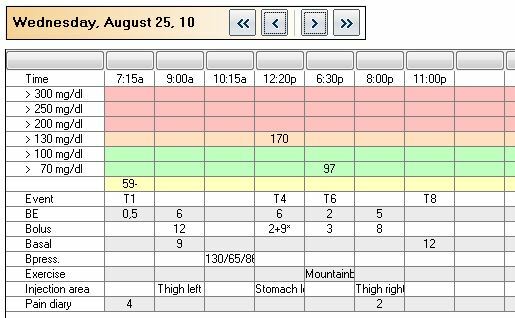 You can see it in the statistic section of the PC version, if you select the entry 'Glucose Profile' in the Graphic type. The US Center for Disease Control found that more than 9% of people in the US have diabetes (https://www.cdc.gov/diabetes/data/statistics/statistics-report.html). By making appropriate lifestyle changes, we can greatly reduce this alarming statistic. 2013-10-26: Daylight saving time ends! This weekend, specifically Sunday night at 3am, daylight saving time ends this year. This means that the watches are then placed one hour _back_ and on Sunday we all can sleep one hour longer.<be> Or we use the time for it to convert all the small watches in our household: in the microwave, the coffee machine, the digital camera and also in our blood glucose meter, insulin pumps, blood pressure monitor, etc. We from SINOVO recommend: FIRST read your devices with SiDiary, THEN switch the device clock. Some devices - such as the Accu-Chek insulin pumps - provide no longer its data after a setting of the time to the software. SiDiary now allows to download data from the new Fora blood glucose meter series (Fora Comfort Pro, Fora Diamond Mini, Fora Diamond Prima and Fora Diamond Voice) on your desktop computer, but also by using the SiDiary app for Android and the app for iPhone. Both apps can connect to the bluetooth enabled blood glucose meters Diamond Mini and GD40b directly without cable and download your values to your logbook directly. The cost-free updates for the mobile SiDiary apps will be pushed as usual by Google Play and iTunes. The PC version can also be updated with a cost-free package from within SiDiary with menu 'Tools->Update-Check'. Here you'll find the Fora website. With our new AddIn it is possible to transfer the data directly from SiDiary to Microsoft® HealthVault® and make data from your blood glucose meters (more than 150 meters integrated right now), insulin pumps etc. availabe in your personal healthcare records. Good news for all users with a BG meter from Sanofi-Aventis/Agamatrix: since today you can download exclusively in our download area a Windows system driver that supports the cables for these devices under 64bit operating systems. So far, such a driver was available for 32-bit systems only. Today we have good news for our mediterranean customers! We have signed an agreement to have an office in Malta to bring support to all our maltese, greek and italian speaking customers. 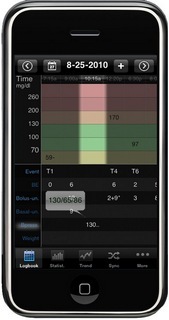 SiDiary is a diabetes management developed by diabetics for diabetics! Well, Tonio Zammit, our new representative in Malta (Europe), is diabetic since more then 10 years. Tonio is based in St.Venera and he will assist you with any question that you might have in using SiDiary, before and after your purchase. Tonio will give you the first level support in your language so please feel free to ask him. In the close future Tonio will provide missing translation packages for the SiDiary user interface since we believe that it is very important to use our application in your native language! Additionally we will follow up with an online website available in these languages too. Tonio is a store keeper at Air Malta with a broad experience, including world-class customer support. We are very glad to have him in our SINOVO team now! We from SINOVO would like to know what you are thinking about diabetes software: what do you like well? What is not so good? What do you miss maybe even? For this reason, we have launched a major survey and as a thank-you we will make a sweepstake to all participants who completed the survey with a couple of very attractive prizes. E.G. an iPad 3, a Samsung Galaxy S2 and an iPod Touch with Retina display. You can find this option under 'Setup -> Settings -> Synchronization. With the latest update now you can import data from the Glooko Logbook app for iPhone! Glooko is a small device (with a cable) that you can connect to an iPhone and then read data from different blood glucose meters. From now on you can download at Google Play the latest version of our Android app! After extensive testing now we have released the new layout of our website officially. To download data directly from the PDM device of your Insulet Omnipod insulin pump into SiSiary you just need to run the most current update. In this way you will be informed automatically, if a new update is available for your device. Fresh released: after an intensive test phase we can present just on time to the (meteorological) begin of summer our version 'SiDiary Android App'. The for the installation necessary file 'SiDiary.apk' can be found on your PC after an update or a fresh installation. More information on how to install to your Android device can be found in the program, menu 'File ->Install mobile devices' if you select 'Android Smartphone'. If you are holder of our license you can register this version with it too. We are proud to announce that SINOVO keeps growing! We have reached an agreement to have a representative in Mexico to bring support to all our Spanish speaking customer all over the world, including Spain and Latin America countries. Since we recognize that there is no substitute to use an application in the native language; now all of our Spanish speaking customers will experience SiDiary in Spanish! 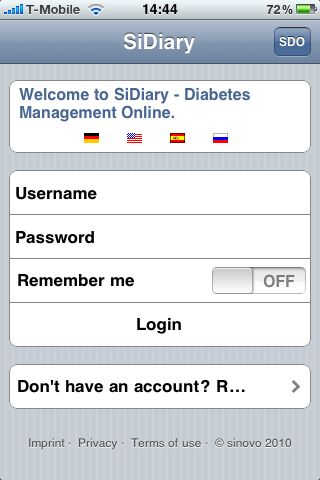 You already know it, SiDiary is a diabetes log book developed by diabetics for diabetics! Well, Gerardo Perez-Ramirez, our new representative in Mexico, belongs to a diabetics family. Gerardo is based in Oaxaca and he will help you to solve any questions that you might have about any of our SiDiary versions, before and after your purchase. Gerardo will give you the first level support on Spanish so please feel free to ask him in Spanish. In fact our team, supported by Gerardo, has been translating to Spanish all the text in our Web page https://www.sidiary.es, manuals and the application itself to make sure that our Spanish speaking customers have everything they need in Spanish. With the current version of SiDiary you can download now the data directly from your 'Sanofi-Aventis BGStar' blood glucose meter. You can use it with an Agamatrix/Wellion Linus cable. Currently the necessary system driver is available for 32Bit operating systems only. 2011-02-14: Enhanced SiDiary Online version! SiDiary Online has a new logbook view! It looks now the same way as the SiDiary PC version, which means the user defined datatypes are now also visible as separate rows. Of course this applies also for the use on mobile platforms like cell phones or tablets with Android operating system. Furthermore you can adjust more settings in the menu 'Extras' like the minimum column number or the width of the columns. The statistics section also equates to the PC version now. The long awaited version for iPhone/iPodTouch is ready and can be purchased directly in the AppStore. Of course it looks like as usual for SiDiary and is as easily operated like all our versions. Don't wonder if the description in the AppStore and the Screenshots are in german: the Interface can be switched into english of course. ...or uninstall your current version of SiDiary 6 und install it fresh with the most recent setup. Data and settings won't be lost during this action. With the most recent update of SiDiary six new meters have been added. Even users of newer Palms or Symbian cell phones can now send their data easily from their mobile devices to SiDiary (PC and Online). Our thanks for that goes to the developers Lars Hendrichs (Palm) and Daniel Hertrich (Symbian). Now you can use SiDiary on your iPhone or Android cell phone as a special designed WebApp! With our most recent version of SiDiary it is possible to import CSV files from Accu-Chek 360°. If you can't choose this export format, then probably you have not chosen it during the installation of 360°. After this you should be able to choose CSV as export format in order to have your 360° data also in SiDiary. With our most recent update its now possible to import data from the CGMS 'Dexcom Seven Plus' into SiDiary. All you need to do is to import from your device into the Dexcom software and then export it. This export file can be imported in your SiDiary. Just before our iPhone-App we have finished the fingerfriendly version for Pocket-PC. The best: you don't need a special capacitive touchscreen to use it. Even on older devices it works, if you press your finger a little bit more on it. Now you can install SiDiary easily on your own USB-Stick! All you need is a USB-Stick, our most recent version (6.0.1208 or above), an open internet connection and a license for the SiDiary buy-version or SiDiary V6-USB-Stick. (Because of technical issues this function is not available in our subscription-version). To perform this action you just need to do some simple mouse clicks and even your already tracked data will be copied to your stick automatically. With our most recent AddIn for the bloodglucosemeter 'Bayer Contour USB' it's possible now to get the data as shown in the software 'WinGlucofacts' into SiDiary 6. You just need to download the AddIn here, unpack it to the SiDiary AddIn folder and start the file 'AddInSetup.exe' (located in the same folder) once. Then after re-starting SiDiary you can activate the AddIn in the menu 'Extras ->AddIns' to get the data from WinGlucofacts into SiDiary. 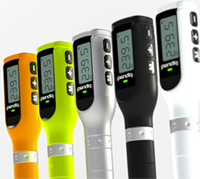 <br style="line-height:5px;" /> In addition to our USB-Stick with an unlimited version of SiDiary 6 (including licenses for all mobile devices and SiDiary Online) you will receive the new 3D-Pedometer ex³ which tracks your daily exercises. These data can be imported/analyzed directly in SiDiary 6. 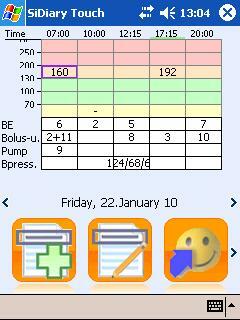 <br style="line-height:5px;" /> Of course you can import your bloodglucose-/bloodpressure meters and insulinpumps too (list with all supported devices). <p style="font-weight:bold">Compared with a single product purchase in our shop you can save € 39.- This offer is available from Nov/14 until Nov/20/2009. Please note, that we cannot ship to outside Europe! SiDiary Online now provides a login with an excisting OpenID Account. OpenID is a standardized "Single Sign-on"-System for websites and other webbased services like SiDiary Online. With your OpenID (a URL) you can login to SiDiary Online and all other webistes (which are supporting OpenID) without username and password! The actual login will be done on the website of your OpenID-Provider like claimid.com. The advantage is that you don't need to remember all of the passwords and logins of your web services but just the one of your OpenID-Provider. Some OpenID providers are also supporting a login with certificates which would give you an additional increase of security. For using an OpenID login at SiDiary Online you simply need an OpenID identity, which is offered by many web services like Google, Yahoo, Facebook etc. After typing your OpenID on the SiDiary Online login website you will be redirected to your OpenID provider. After completing this provider login you will automatically redirected back to SiDiary Online that will also recognize your valid login. Today we have released new version 6. After almost two years of development we are proud to present a new milestone in diabetes management software. With SiDiary version 6, which especially offers a more user-friendly programme overview, we have completely updated SiDiary version 5. Other functions have been optimized, such as the data import from blood glucose meters, insulin pumps or blood pressure meters. Data, which was manually entered and imported from well- established blood glucose meters, can be synchronized between all mobile devices and is available for interpretation and statistics. With SiDiary version 6 you are able to process even more parameters than with version 5. Additional relevant data, which has been defined by the user according to his specific requirements, can also be tracked and analyzed. Furthermore you are able to print out reports even more easily than before with SiDiary version 6. SiDiary 6 supports the co-operation between doctors/diabetes consultants and diabetics. This represents a further step towards telemonitoring: the patient is able to send his doctor the relevant data by e-mail or the patient can release the data directly for the doctor with the SiDiary online version. Physicians ‘offices and hospitals benefit from a network-compatible version. 2008-10-17 Update: Symbian, One Touch Vita, Animas pumps. You can now register for the SiDiary V6 Beta-Program. Click here to getting started with the brandnew version. Red Five Labs and SINOVO team-up to bring SiDiary to Nokia S60 mobile phones: Red Five Labs, a leading mobile-technology company, is providing a framework (Net60) which enables .NET applications to run on SYMBIAN mobile phones. The partnership with Sinovo is a perfect example of the added value brought by Net60. Red Five Labs helps enrich the S60 platform with great apps like SiDiary which otherwise would only be available on Windows Mobile. Please visit our news section for further announcements about availability of SiDiary-Net60. There will be a server maintenance on February, 28 2008 from 10:00 (MEZ) am until approximately 02:00 pm. The server will not be reachable or will have limited access at this time. With the new SiDiary online service you can now send your diabetes data directly over the air from your Windows Smartphone, Java enabled cellphone or your Pocket PC without any PC-connection! Please read full story here. A new driver for Abbott's Freestyle Freedom Lite and a driver update for Accu-Chek Smart Pix are available in our download-section for free. The updated SiDiary driver for Smart-Pix is optimized for the recently released firmware update (V2.0) of the Smart Pix device but of course the driver will still read older Smart Pix communication boxes (V1.0 - 1.03). SINOVO will present newest innovations in Digital Diabetes Management in Germany and Austria in Autumn 2007. -13 October 2007 at the 25.Pump Event at Diabetes Village Althausen taking place from 10.30 at the "Festhalle" in Althausen. The Driver for the new meter Freestyle Lite has been released today. Please download the new driver at our Download->Update Area. Freestyle lite, follower of the Freestyle Mini will be available in retail shops in a short time. The world smallest Blood sugar meter comes with an average measuring time of 5 seconds - a coding of control strips is not necessary. 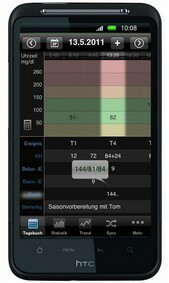 SINOVO with its Diabetes Management Software is partner of the Event Days at Titusapotheke (Pharmacy) in Frankfurt. The Evnet Days are taking place from 15th to 20th January 2007 and are including a free Blood Sugar Measurement and a lot of information about Diabetes. Within the framework of World Diabetes Day 2006, SINOVO presented 3 exclusive Promotion Bundles within the Blood Sugar Measuring Instruments Freestyle Mini from Abbott Diagnostic Care and the Blood Pressure meter Medilife PC2 by BOSO. All Bundles included the fully SiDiary Suite and were equipped with appropriate communication cables. According to the Slogan of the WDD "Diabetescare for Everyone?, exclusive and unique Promotion-Prices could be passed on to our customers. 2006-10-02 PPC.Net Version official release. Today we have released a second Pocket PC Version of SiDiary. This Version was developed from scratch within Microsoft's .Net ("DotNet")-Framework and supports all features of the previous "embeddedVB" Version which is still available.The new version supports more devices especially with the Windows Mobile 5 operating system and provides a better window handling, which basically means that you can use it even with square size displays! With this official release SINOVO completed a large development project which became neccessary with a new generation of mobile devices. Since it was available for several months first as a "WM5-preview-version" and later on as a Beta-release it has already proved it's road capability. 2006-08-01 Driver for One Touch Ultra 2 released! 2005-11-10 World-Diabetes-Day - SiDiary's birthday gift! On November 14th all individuals concerned with diabetes will celebrate the World Diabetes Day. The date was chosen as it is the birthday of Frederick Banting who, along with Charles Best, first conceived the idea which led to the discovery of insulin in 1922. Many lifes of the today's 200 million people with diabetes spread all over the world are basically linked with this fundamental discovery so they can live pretty well with a therapy like ICT (intensive conventional therapy). Since our mobile solution is helping many patients in tracking the important therapy parameters, SINOVO will provide a special birthday gift by reducing the licence fees for SiDiary for 30% on World Diabetes Day! 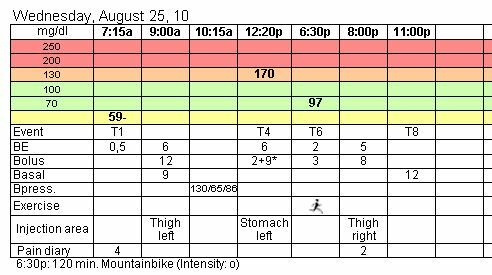 Last Friday I got my A1C-result: 5,5% (the upper end of my laboratory's reference region is 6,1%). So I have improved my parameters once again - thanks to SiDiary and my plasma-calibrated Freestyle Flash! This year is close to the end, time for a short summary: This first year with SiDiary was exciting, thrilling and it was a year with unbelievable success for SiDiary. When I started on January 2004, I never thought that it could end in such a project. Every single diabetic which has improved his condition by using SiDiary is in fact a great success. But this positive feedback in my inbox is incredible. I wish every single user out in the world and all visitors of this site a merry christmas and a great year 2005 - particularly a healthy one! 2004-07-29 Update at the download section! 2004-02-05 New version 2.1.56 released. 2004-01-23 SiDiary runs on Pocket PC 2003 mobile edition! 2004-01-20 Yesterday's date format issues now solved! 2004-01-19 Problems with date format? 2004-01-05 Now we're on the air! 2004-01-02 Unit of blood glucose implemented. 2003-12-30 Web site is finished.